The first Age of Aranna was ruled by an overlord with absolute control of magic itself, and ended in a cataclysm that consumed both he, and the amassed armies of the rebellion. In the millenium since that fateful day, the magic has flowed freely to any who would command it, but the tide has finally begun to wane, heeding instead the call of its ancient legacy. From the Plain of Tears a new heir beckons, and with each day his strength grows. Consuming those who submit, eradicating those who resist. With none to oppose his ascendance, the circle will be complete, and an ancient age will begin anew. What fate will befall the Second Age? 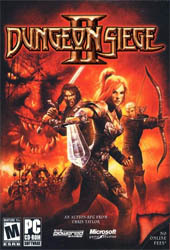 The time for judgment is nigh, and in Dungeon Siege II, the sequel to the best-selling RPG from Gas Powered Games, you have been called upon to wield sword and spell as the last hope of Aranna.